Ketosis is a condition that occurs when ketone bodies are produced from fatty acids as a result of the body metabolizing stored fat instead of carbohydrates. Ketosis is usually caused by a very low intake of carbohydrates which can occur during a diet or period of starvation. It can however also occur if a person consumes excess amounts of alcohol. Usually glycogen in the liver is broken down into glucose when energy is needed. However, if the glycogen reserves become depleted then the liver will switch to breaking down fats, usually triglycerides, resulting in the production of a low number of ketone bodies. Ketosis is used as part of the ketogenic diet and has been used in helping children with epilepsy where other treatments, such as medication, have failed. Ketone bodies may influence neurotransmitters in the brain and in this way have an anticonvulsant effect. The purpose of a ketogenic diet is to force the body into ketosis by eating very few carbohydrates. Ketosis represents a shift, with energy being produced primarily from ketone bodies instead of the usual source which is glucose. There are some positive effects to ketosis such as weight loss and appetite suppression in some people; and it has helped children who are epileptic. However there are negative side effects such as bad breath and a feeling of weakness and fatigue. A person may also experience an inability to sleep well and gastrointestinal changes or upsets such as constipation or diarrhea. These symptoms are usually quite mild. Although ketone bodies are produced during ketosis, there are not so many produced that a dangerous condition of acidosis results. There may be unpleasant side effects to begin with and excess amounts of water can be lost when you undergo ketosis, which means you can be susceptible to dehydration. It is thus very important to always consult with a doctor if you are wanting to diet in order to achieve ketosis. Ketosis is not dangerous unless it becomes extreme and you end up with excessive amounts of ketones at which point you may end up with ketoacidosis which is dangerous. Ketoacidosis is often also known as diabetic ketoacidosis or DKA and refers to the accumulation of excess acids known as ketone bodies in the blood such that your blood becomes too acidic. Ketoacidosis occurs most often in people who have type I diabetes mellitus and do not produce enough insulin. A lack of insulin means that the body cannot break down sugars to release energy and instead starts to break down fats, producing a large number of ketones that can be detected in the blood. Since sugar is not broken down, high levels accumulate causing many problems. Although much less common, some people can have DKA in type 2 diabetes. 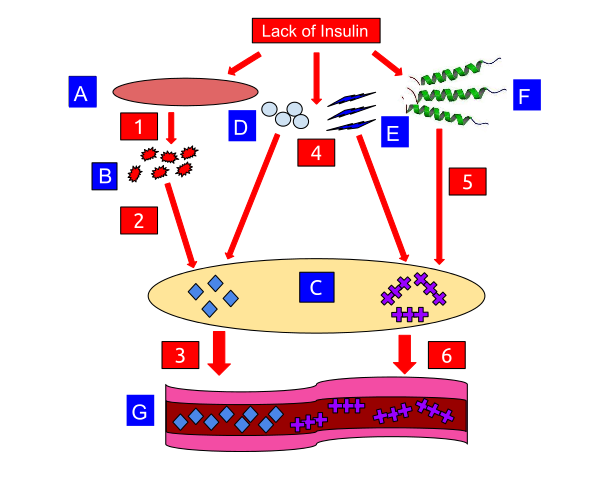 This condition is known as ketone-prone type 2 diabetes. Ketoacidosis in people who do not have diabetes is rare, but can happen if a person has severely starved, resulting in glucose that is so low that the person enters metabolic acidosis. There are several effects and symptoms a person has when they are in a state of ketoacidosis. These include having a bad breath, extreme thirst, frequent urination, nausea, vomiting, mental confusion and exhaustion. These effects that are felt are often the first indications that a person has diabetes. Ketoacidosis is very dangerous and causes many deaths in diabetics, especially in people who are younger than 24 years of age. If not treated quickly ketoacidosis can result in coma which can progress to death. A person’s body and blood has to be maintained within a narrow range of pH values in order for the enzymes we rely on to work, outside this pH range chemical reactions cannot occur. This is why ketoacidosis can result in death. 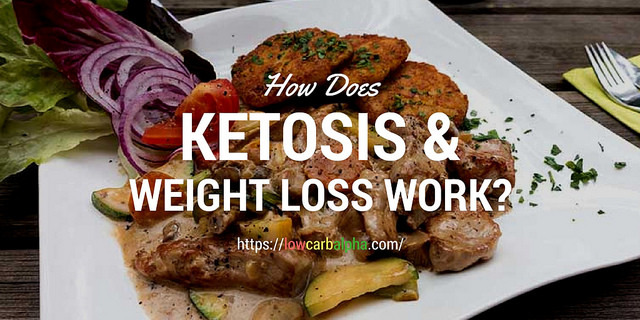 Ketosis is when only a low number of ketone bodies are present in the blood, while ketoacidosis is when a large number of ketone bodies are present in the blood. Ketosis is often intentionally caused by people who are following a diet such as the ketogenic diet where carbohydrate intake is limited, while ketoacidosis is often an unintentional consequence of diabetes I (due to low insulin) or from extreme starvation. Ketosis can have health benefits leading to weight loss, but ketoacidosis has no health benefits and can lead to coma and death. Ketosis can cause a person to feel weak and tired, while ketoacidosis can cause this and can also cause mental confusion, nausea and vomiting, extreme thirst and dehydration. Ketosis is not normally dangerous, while ketoacidosis is always dangerous and can lead to coma and death. Ketosis and ketoacidosis both involve ketone bodies being produced in the body, however in ketosis only a few ketone bodies are produced. Ketosis is often achieved when a person follows a very low carbohydrate diet. Ketosis can have health benefits such as weight loss, but should be avoided if you are ill or have certain medical conditions. Ketoacidosis involves high levels of ketone bodies being produced causing the blood to become too acidic. Ketoacidosis is dangerous and occurs most often in people who have type 1 diabetes. Ketoacidosis unlike ketosis can result in coma and death and should therefore be treated quickly. Dr. Rae Osborn. 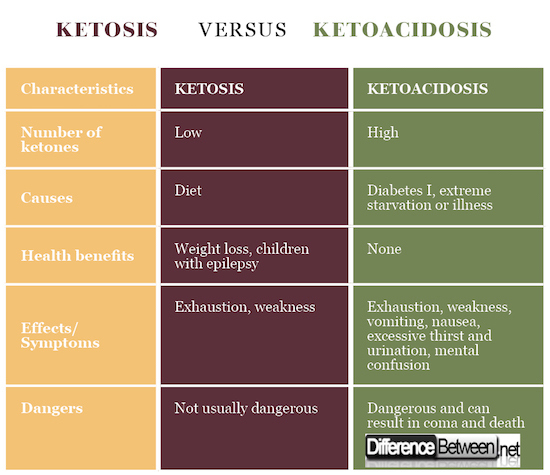 "Difference Between Ketosis and Ketoacidosis." DifferenceBetween.net. April 5, 2018 < http://www.differencebetween.net/science/difference-between-ketosis-and-ketoacidosis/ >. McNally, Melanie A., and Adam L. Hartman. "Ketone bodies in epilepsy." Journal of neurochemistry 121.1 (2012): 28-35.
von Geijer, Louise, and Magnus Ekelund. "Ketoacidosis associated with low-carbohydrate diet in a non-diabetic lactating woman: a case report." Journal of medical case reports 9.1 (2015): 224.